Ace Home Improvements have been making houses “homes” since 1953. It all started back in 1953 with our great-grandfather, Gus Fisher selling storm windows and doors, door-to door in Freehold, NJ. The Ace Aluminum business has been steeped in Monmouth County for ages, going beyond your basic home improvement contractors and offering the very best products and customer service in home renovation, bar none! 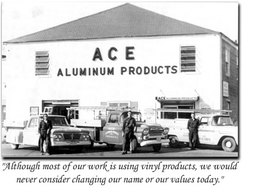 Located in Manalapan NJ, Ace Home Improvement (formerly Ace Aluminum) has been in the family, down four generations! We cultivate such trust with our clients that we have now had their grandparents, parents, and grandchildren! Ace is a one- stop shop that distributes, installs and services all our products! Each one of our expert installers are highly trained craftsmen that follow the pinnacle of industry standards and have great pride in their crafts. Whether you are looking for roof installation services or trim & gutter installation and repair, each one of our craftsmen is highly-skilled in his domain, meaning we will only send you a windows expert if you’re looking for windows and the like. When you shop with the “Big boys” or big name home remodeling contractors, you may or may not get a professional who knows what he is doing! This means you’re taking a pricey risk when you put your precious home in the hands of a big shop. Can you afford to take such a risk? When you work with Ace, you’re working with trained experts who only use the absolute highest quality products in home contracting. long-standing in the business—some have been with us for up to 30 years! When you’re ready to make your house a “home,” you can feel at ease when you choose Ace Home Improvements for your roof installation or home remodeling needs! We are licensed, insured, and a proud member of The Better Business Bureau (BBB), the National Federation of Independent Businesses (NFIB), The Monmouth County Chamber of Commerce. Visit our showroom today at 342 U.S. 9 Manalapan, NJ 07726, call or email us.